When it comes to Instagrammable places around Chicago, Cloud Gate and the Skyline backdrop come to many minds, rightfully so. It’s no secret that Chicago has a beautiful skyline that’s deservingly photographed by millions each year and appears all over social media, namely Instagram. However, there’s plenty of other Instagram worthy places to snap and post from around the city. I joined Chicago Safaris for a tour of Instagrammable places in Chicago along with a few of my blogger friends and local 219 out of Northwest Indiana. We had a ball, and I discovered a few new spots. Here’s a recap of 5 Instagrammable places we visited throughout the day. I was told this place gets pretty lively at night. However, our tour stopped in late Saturday morning for appetizers and cocktails. Space is plentiful and cozy with a large fireplace as a focal point for photos. The wall of greenery makes a beautiful backdrop too. Not only is the interior Instagrammable but the cocktails are too. They make a delicious Bloody Mary; the Jalapeno Passion Margarita is also a winner. Bottled Blonde would be a fun spot to gather and chill with friends. There’s also plenty of TVs for sports lovers. You must try the Mac N Cheese; it’s fantastic. All of our appetizers were good. We munched on the burrata, Tartufo fries, chicken wings, and as mention mac N cheese. If their other menu items are as good as the appetizers, you can’t go wrong. You’ll find the Flamingo Mural in Chicago’s River North neighborhood on the corner of Wells and Ohio St. I’ve been an admirer of this mural for a long time. Its fun and colorful, with fanciful detail. Paradise Park in Wicker Park is a trailer park themed pizzeria and an Instagrammers paradise! Everything about this place screams snap and post on Instagram! The outdoor garden has a trailer parked with the same folding chairs that made appearances at all of my family picnics growing up, lol. The astroturf and flamingos add to the nostalgia vibe. We learned that the patio would be covered soon so that guests can enjoy the outdoor garden year round. The interior has an eclectic flashy feel while still being cozy. Can’t go wrong with a blinged out wall and neon lights. The cocktails are clever with names like Dirty Like your Mom, Trashy Tea, The Hooch, and Pink Flamingo. Do yourself a favor and order the Mercenary pizza, it’s outstanding! One can’t list Instagrammable spots of Chicago without mentioning the Greetings From Chicago Mural in Logan Square! Created to resemble a postcard, this famous street art captures the essence of the city beautifully and is one of my favorites. Creators, muralist Victor Ving, and photographer Lisa Beggs travel the country designing artwork that captures the pride of locals for their hometowns while sparking the interests of visitors. 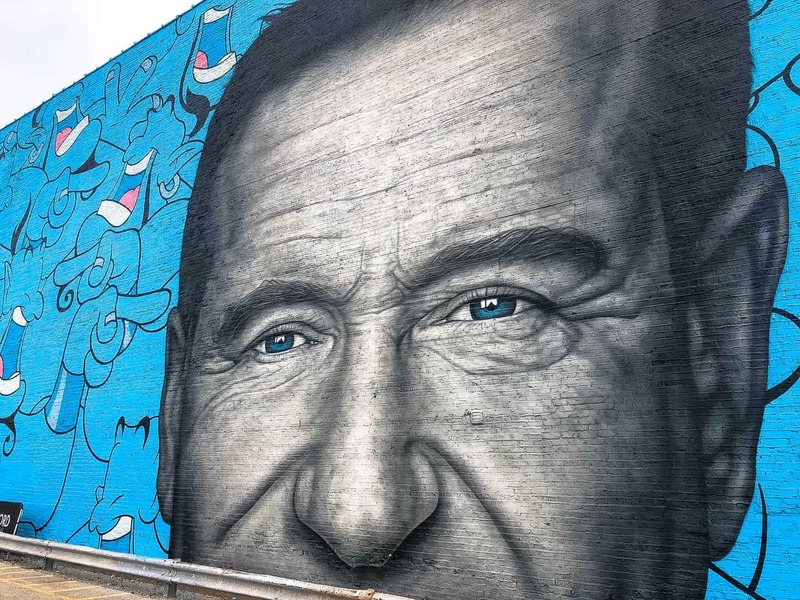 The mural of Chicago native Robin Williams results from a collaboration of artists Jerkface and Owen Dippie. I’ve desired to pay a visit to this touching tribute for a while. Robin Williams was a genius who made us laugh while battling inner darkness due to mental illness. His death is heartbreaking and a reminder that more discussions need to take place to build mental health awareness and remove the stigma associated with it. The mural is located in Logan Square: 2047 N. Milwaukee Ave.
Just a glimpse into the treasures located in some of Chicago’s neighborhoods. Chicago’s downtown is terrific, but there’s much more to see beyond there. It’s very walkable here. I stumble upon many new spots just strolling or biking through the numerous city neighborhoods. Hope that you’ll visit some of the other communities and get a peek. If you’re looking for a tour that allows some walking along with driving while visiting the city, check out Chicago Safaris. The fun starts as soon as you step into one of their luxury vans! I friggin love that robin Williams mural…makes me cry! Yeah, it’s truly deserves a visit. Wow, all these places are incredible! I love that Robin Williams mural. I travel to Chicago all the time for work and I have never seen these places! I never guessed it was Chicago. Great post!! Pics are amazing as always!! !